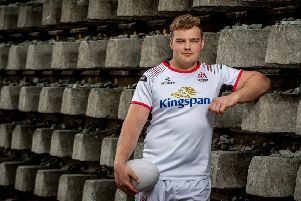 Since the announcement at the end of January that the PRO12 Grand final would be hosted at the Kingspan Stadium, Ulster have been under pressure to make the decider at the end of May. Victory over Leinster last time out has guaranteed Neil Doak’s side a place in the semi-final but Ireland centre Jared Payne knows the side now must kick on a secure a home semi final staring with beating Munster on Saturday at the Belfast venue.. The win over Leinster also ended the Dubliners season and it was sweet revenge for Ulster for the last four season when the RDS outfit have beaten Ulster in knockout games. “Against Leinster they (Ruan Pienaar and Paddy Jackson) put us in the right parts of the field and we squeezed them after starting pretty poorly,” said Payne. “They controlled field position and slowly squeezed them out of the game which was good to see. “There were a few choice words (after in the dressing room), it was a pretty tough game and then afterwards it was just nice to secure a semi-final spot but at the same time we’ve done nothing yet. It may be clichéd but Payne isn’t looking further than Munster. “It’s a challenge, I think the older you get you just worry about what happens week to week, if you look too far into the future you’re going to forget about tomorrow so, look, for me personally it’s not an issue. One reason for Ulster success this season has been Payne’s partnership with Darren Cave in the Ulster midfield. “Cavey’s been in wonderful form and one of the most consistent performers for Ulster,” said Payne. Payne is backing Les Kiss to be a huge success when he takes over in the hot seat at the Kingspan after the world cup. “It’s wonderful for Ulster to have that experience, Les is a great coach and he gets the best out of his players. “It’s going to be massive for not just the older guys but the younger ones coming through to have that knowledge help them is going to be valuable for them.